Abstract - In the field of software engineering, during the development and maintenance of software, the information on the classes which are more prone to be changed is very useful. Developers can make more flexible software by modifying the part of classes which are more sensitive to changes.The incessant changes effected in software every day have assumed such an alarming proportion causing untold and unimagined paradoxes that it is highly essential to initiate instant and immediate steps to balance this blitz. It does not mean that no endeavor has been made in the bye-gone era to tackle the issue. In fact, several methods to solve this dilemma were introduced in the past by predicting the changes in the software. To handle this problem with an eye on good prediction accuracy, a new hybrid model is introduced in our paper. Our proposed model combines features such as behavioral dependency generated from UML diagrams, execution time and trace events generated from source code to predict change prone class. The rationale behind this approach is that in a well designed software system feature enhancement or corrective maintenance should affect a limited amount of existing code. Abstract - Recently, (LTE) Long Term Evolution appeared as a robust technology to meet (4G) Fourth Generation cellular networks requirements. Apparently, there are three sets of cryptographic algorithms that work on LTE technology and each set based on core algorithm. Therefore, in this paper we are focusing on reviewing the three sets of the LTE cryptographic algorithms and their core algorithms and then comparing them based on different factors in order to understand their cons and pros and provide valuable information about LTE security. 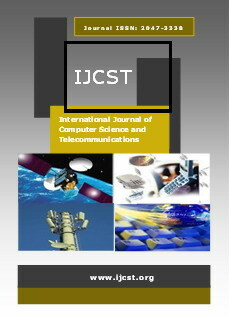 Abstract - The research initiatives addressed in this paper are geared towards improving the performance of Orthogonal Frequency Division Multiple Access (OFDMA) based Long-Reach Passive Optical Network (LR-PON) through the Dynamic Time & Sub-carrier Allocation (DTSA) protocol which is supported by the E.U. FP7 project ACCORDANCE. In particular, the aim of the research undertaken is to enhance resource allocation by controlling the timing issue offered by Two-State Dynamic Bandwidth Allocation (TSDBA) by means of providing subscribers to fulfill associated bandwidth requirements on demand. By analyzing the limitation of DTSA protocol, our aim is to provide a variety of desirable characteristics, such as increased aggregate bandwidth and scalability, enhanced resource alloaction flexibility, longer reach, lower equipment cost/complexity, minimizing overhead delay and ensure increased network throughput. Abstract - This paper proposes an algorithms codes whereby a multiplexer/demultiplexer formed of cascaded AWG stages results in total channel accumulated crosstalk reduction which allows for more DWDM channel count. Assuming the transmittance in linear units for each cascade stage, and that each stage has a Gaussian spectral response envelope, obtained an equations of two-stage and three-stage were transformed into Matlab programs these programs transferred into an algorithms steps in order to be used by any other program languages. Abstract - Network lifetime can be improved by proficient clustering algorithms in heterogeneous wireless sensor networks. Coordination through cluster head selection provides efficient data aggregation that reduces communication overhead in the network. In this paper, we propose a fuzzy logic approach based DDEEC clustering algorithm which aims to prolong the lifetime of nodes in heterogeneous WSNs. We compare this algorithm with the PSO based DDEEC algorithm and original DDEEC algorithm according to the parameters of first node dies at different rounds and energy-efficiency metrics. The efficiency of proposed optimized fuzzy algorithm is proved by the Matlab experimental results. Simulation results exhibits that the proposed algorithm has higher energy efficiency and can improve life span of a node and data delivery at the base station over its comparatives. Abstract - The research was conducted the text feature weighting on Indonesian text by using binary logistic regression algorithms. Features of the text using text features eleven . Eleven text features used are sentence position, positive keyword negative keywords, similarity between sentences, sentences that resemble the title sentence, sentences containing names of entities, sentences that contain numeric data, length of sentence, the connection between sentences, the sum of the weight of the connection between sentences, and sentence semantics. The purpose of this research was to conduct the optimization of summarization text by using binary logistic regression algorithm and the influence of the eleven features text by using binary logistic regression algorithms. Binary logistic regression algorithm used in compression rate 30%. The results of this research show the accuracy of compaction on the 30% compression rate amount 91.1% and on ”positive keyword (f2)” can represent the eleven text features to perform compaction of text.